The enchanting ballet film, The Red Shoes (1948), starring Moira Shearer, will air at 11:30 p.m. July 7 on TCM as part of its 48-hour marathon of Technicolor films. 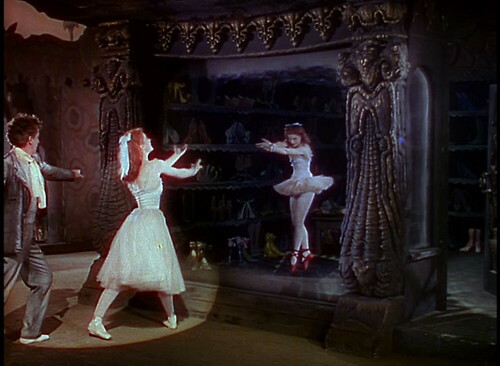 The British movie, The Red Shoes (1948), is one of the best movies ever made about the ballet and it also stands alongside The Wizard of Oz (1939) as one of the great fantasy films of all time. The Red Shoes tells the story of a young ballerina, Vicky Page (Moira Shearer), who wants to become a star in the prestigious Ballet Lermontov. The ballet's director (Anton Walbrook) reluctantly takes Vicky on, but after his star ballerina (Ludmilla Tcherina) leaves, he decides to mold Vicky into a great dancer for his new ballet The Red Shoes. However, when Vicky falls in love with a young composer (Marius Goring), she must choose between love and art. Emeric Pressburger, who co-directed The Red Shoes with Michael Powell, originally wrote the screenplay for a drama starring Merle Oberon. That project never got off the ground so Powell and Pressburger decided to re-work the screenplay to make a film that would focus on dance with a real ballet serving as the dramatic climax of the film. Vicky (Moira Shearer) and Lermontov (Anton Walbrook) discuss the ballet in The Red Shoes (1948). Powell and Pressburger hired internationally acclaimed dancers for most of the principal roles. Shearer was a star at the Sadler's Wells Theatre, but The Red Shoes also features international ballet stars like Robert Helpmann as Shearer's dancing partner and Leonide Massine as the company's choreographer. The directors commitment to realism enhances many of The Red Shoes backstage scenes. The movie is one of the few dance films that show the really difficult work required to make great art. 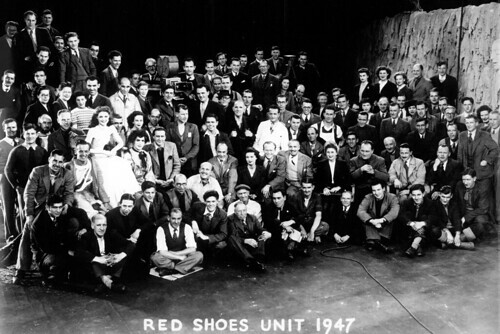 The cast and crew of The Red Shoes (1948) gather for a company photograph. Powell and Pressburger also needed dancers for the 15-minute ballet sequence that is the highlight of the film. The Red Shoes is an original ballet composed by Brian Easdale and choreographed by Helpmann and Massine. It is based on Han's Christian Andersen's fairy tale about a young girl who buys a pair of enchanted red shoes that lead her to a tragic fate. Ljubov (Leonide Massine) and Vicky (Moira Shearer) rehearse a scene in The Red Shoes (1948). Ballet sequences were a postwar trend thanks to the dream scene in Richard Rodgers and Oscar Hammerstein's Oklahoma!, but The Red Shoes is far and away the best ballet ever put on film. Most dance sequences reveal the inner thoughts of the characters; for example, the ballet in Oklahoma! deals with Laurey's conflicted feelings about Judd and Curly. The Red Shoes is an expression of Vicky's psyche, but it is so much more than that. Vicky, is obsessed with becoming a great dancer, and her future as a ballerina hinges on her performance in The Red Shoes. The audience cares deeply about Vicky thanks to Shearer's sensitive performance. This makes the audience emotionally invest in what is happening during the ballet, instead of just watching pretty dancers go through their paces on elaborate sets. 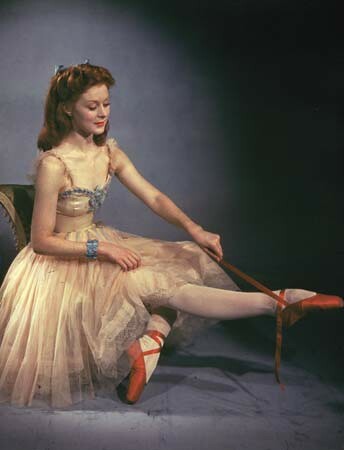 Moira Shearer imagines herself wearing a pair of red shoes in the ballet sequence. The Red Shoes was a modest hit in Britain, but it didn't really take off until it reached the United States. Universal Studios acquired the American rights to the movie, and after an 110 week sold out run at one Manhattan theater, Universal executives realized they had a hit on their hands. The Red Shoes became one of the highest grossing British films in history and it went on to win Oscars for Best Art Decoration and Best Musical Score. The Red Shoes is available on DVD and video on demand.